This is the fun imaged called AKV deer... this little guy is so cute. It's quite a simple card and you can make it even simpler or not.. 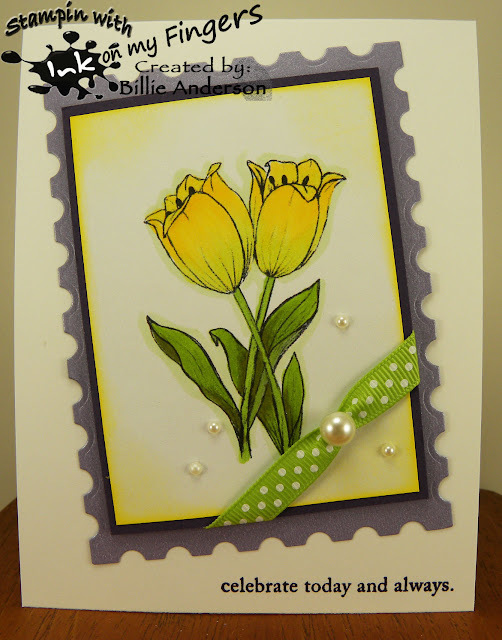 I used a Kraft strip and stamped Simon Says sentiment and used Quick Quote ink to distress the edges. I used Simon Says stitch die and My Favorite Things circle die and cut the image out. I colored the image in Copcis using various browns.. I die cut the holly from Paper Trey ink and used a little Quick Quote ink to give some depth. I die cut the pretty leaves with Stampin Up die set. I then added some goosebumps to the holly and called it quit. I love the look. I hope you pick up this fun image.. Since it's too late for this years Christmas you'll have next years image. Monika at Creative with Monika in Germany .. We exchanged die cuts .. mine has stitching and her doesn't .. I like the shinny purple and then I added a darker purple behind the image. I added a fun ribbon and half pearls. 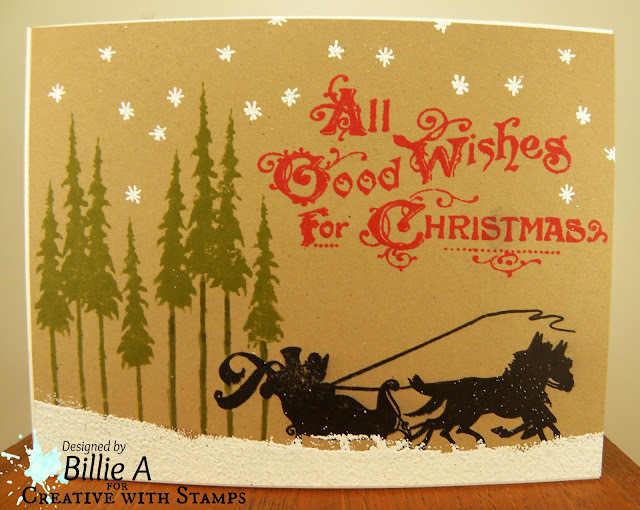 The sentiment is from Paper Trey Ink stamped in Stampin up ink. The image is colored with copics..
Hope you find time to play along at Inspiration Destination. Well this is my first Christmas card for 2017.. LOL poor thinking on my part but I loved this image and wanted to use it and now was the time.. I guess since I am also on Catch the bug design team I could of used it there.. but nope.. I am using it now.. So I am one card a head for 2017.. 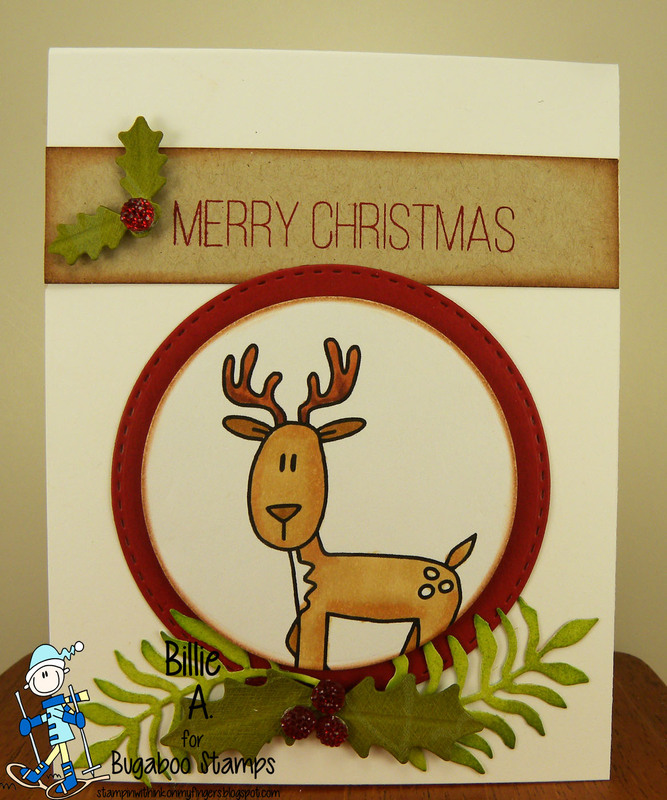 I used Kraft and stamped Be Joyful and Merry Christmas by Simon Says over the background in Stampin Up ink. 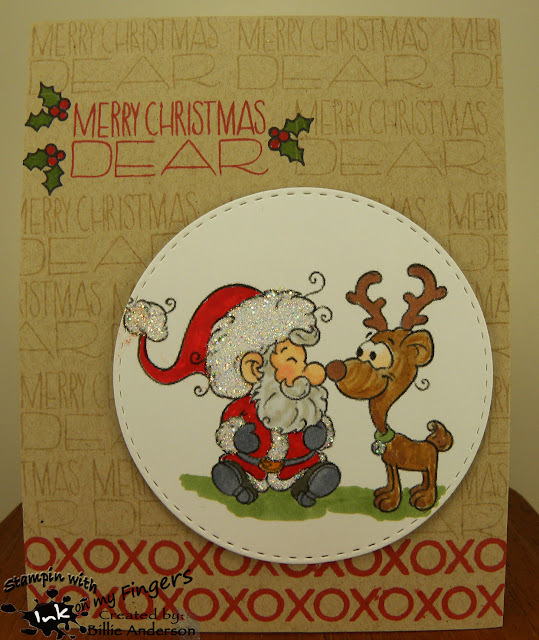 I then embossed the red base behind the image with large dot embossing folder.. I colored the image with copics and added some glitter on all three images. 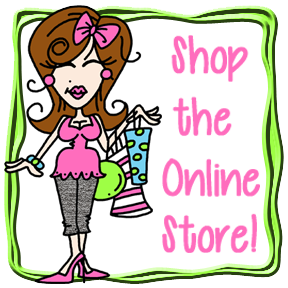 Love Bugaboo images.. This is my card using the fun image called Flirty Flora Valentine girl... I decided to make her a birthday girl.. I first used Simon says Happy Birthday stamp and then in the blank area I used Simon says large heart stamp. I did this all over the base of the card. It's kind a hard to see that it says Happy Birthday so I tried to have it show through the frame and along the bottom. I used wink of stella on the hearts. I colored the image and decided to use some teal so I added the ribbons to the side of the frame to tie the colors in. 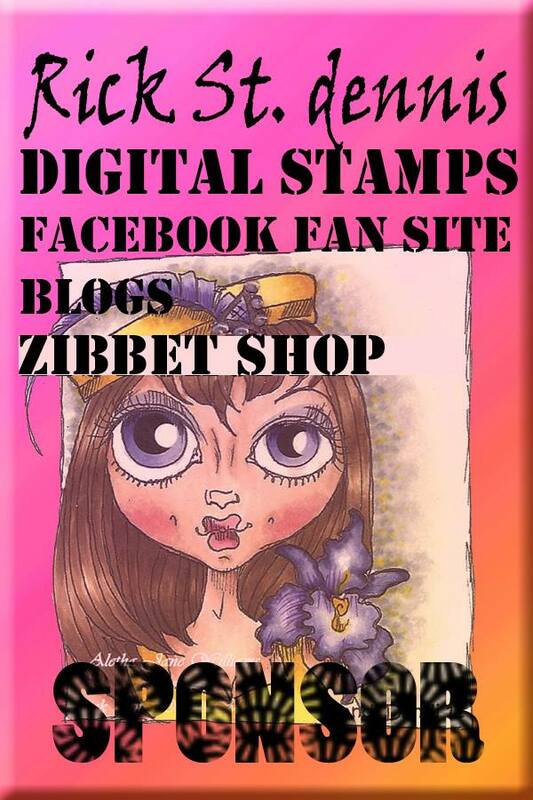 The frame is my postage stamp die and using the next size smaller inside when I cut it so it gives a frame look. She looks like she is ready for some Birthday partyin.. I sure hope you find time to play along at Inspiration Destination.. 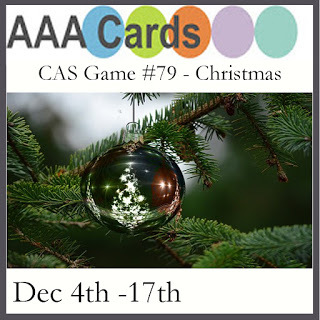 It's Always ATG.. Sure you have some Christmas / Holiday cards you can post..
Hello.. 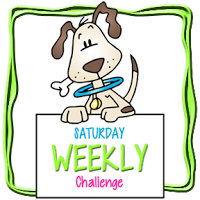 I have a fun Saturday card to share with you today. My baby brother Mark got married to his partner Trey after 13 years together on December 3, 2016. They finally tied the knot.. I am sure some of you don't believe in this. .. but I love my brother and stand by him and feel we all deserve love and happiness between consenting adults. We've come a long way in this world and I have dear friends who are gay and I have no issues. I don't think this defines who we are. There are so many things that make us who we are. We are all human and have issues.. I'm overweight so I'm sure there are people who look at this as wrong and have issues with my body, my looks. I remember growing up and being left handed and teachers (this was in the early 50's) trying to make me right handed because it was the right thing to be.. well it didn't work. I'm still left handed even though I use my right hand for some things only because there didn't happen to be left handed scissors or measuring cups available for me. Any way back to my card.. I cut the figures in the background out of black.. these are the friends and family who stand up for the married couple and wish them well.. 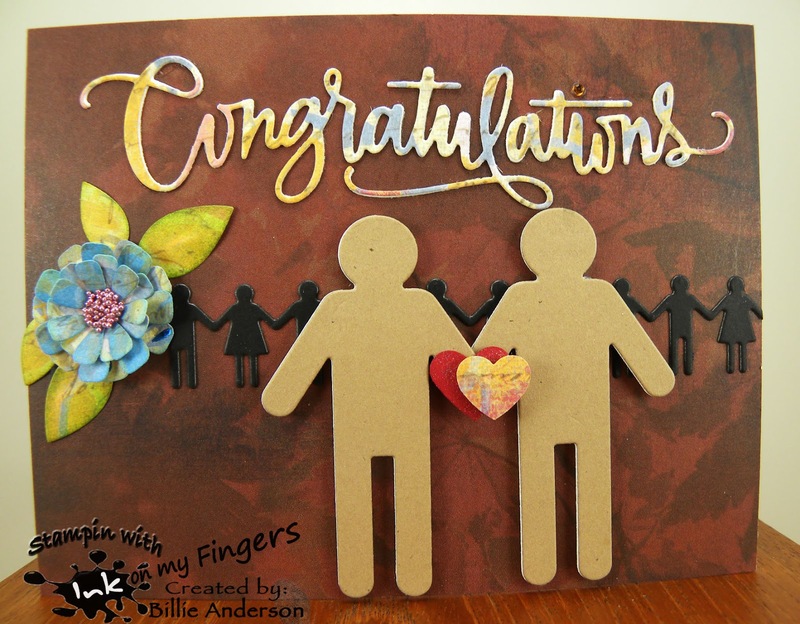 I cut the gentlemen out of kraft and punched out a Stampin up heart and EK heart and adhered it over their joined hands. I used my Spectrum Noir sparkle pen on the hearts. I cut the Congratulations by Simon Says out of a scrap piece of DCWV paper. I like the colors and also carried it over to the flower. The flower die is from My Favorite things, in fact all dies except the word is MFT.. I did use some Quick Quote ink on the flower petals and leaves. I added some micro mini beads to the center of the flower. The background paper is a scrap I think from DCWV. I love the message this card give. I'll have to keep this in mind for another wedding card. I hope they have many more years of happiness and building more memories..
Add this graphic banner below to your blog. Another fun Christmas card. I used Simon Says stamps. I stamped the trees in Ranger ink and used copic to add the trunks behind the sleigh. 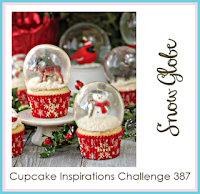 I embossed the snow and snowflakes. Give great texture. 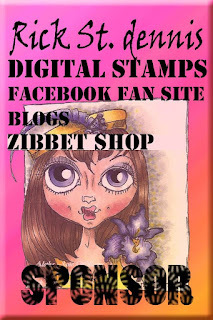 I have never used this stamp set.. well I used the sentiment at one time.. but the rest never. It was fun making this card. 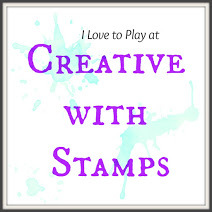 But we still have challenges for Creative with Stamps and Inspiration Destination.. Hope you find time to play along.. 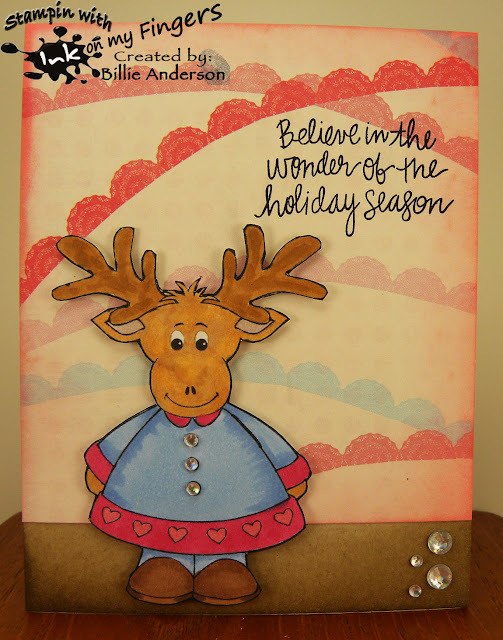 This is my card using the image Moose.. I thought it could be for Valentines but also Christmas. I chose this cute background banners paper scrap I had and I wanted it upside down vs. swaying down banner.. I like the look and I gave her some spiffy looking cloths.. The sentiment is from Simon Says ... I sure hope you find time to play along and enter at Inspiration Destination. 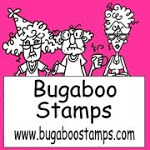 Welcome to a new challenge at Catch the bug..
You can find awesome images at the Bugaboo Store.. 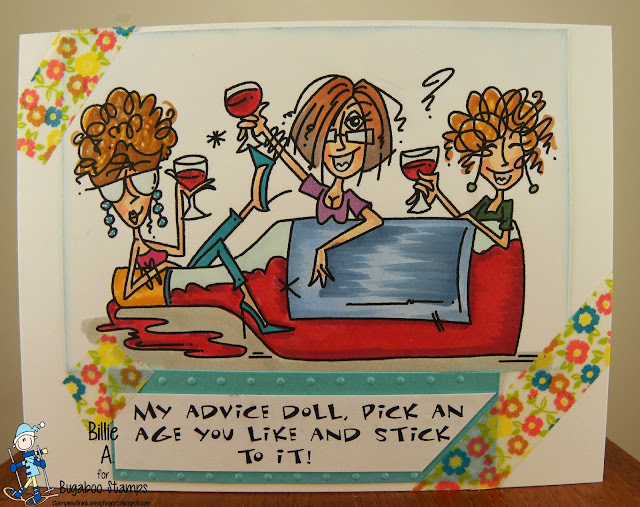 This is my card and I used the image called Friends don't le friends wine alone I chose to use a fun sentiment from Art Impressions.. I thought it went well with the image and then add Happy Birthday inside the card. I colored the image in Copics and used Washi tape. I mounted the sentiment on an embossed strip. Looks like these girls are having too much fun.. Hope it made you laugh and that you play along over at Catch the bug. 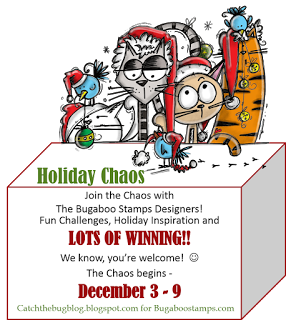 Welcome to our Holiday Chaos at Catch the bug with images from Bugaboo..
Day 7.. our last day :( I sure hope y'all have had fun. 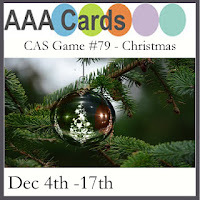 The theme for todays card is to use the Free Friday image Crabby Cat Christmas and BINGO.. 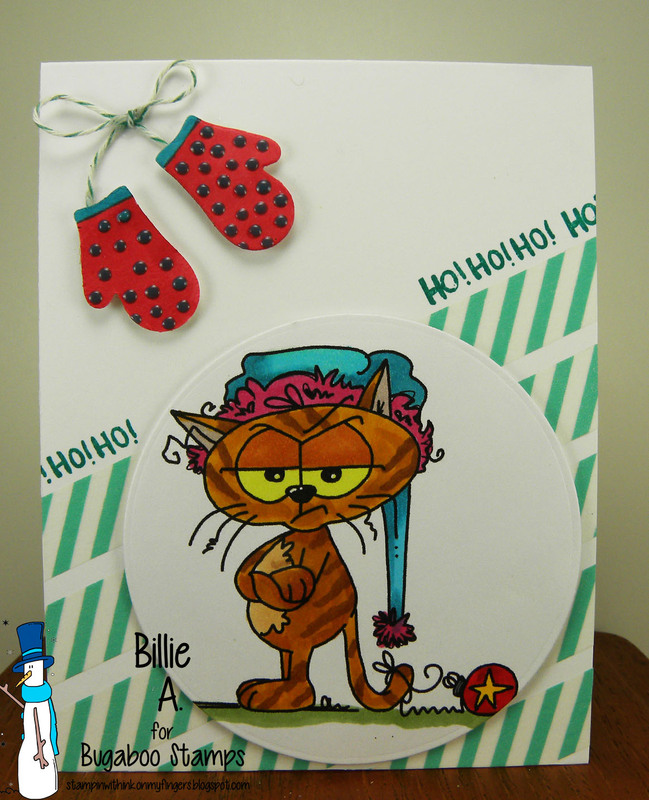 This is my card using the FREE FRIDAY crabby cat Christmas.. 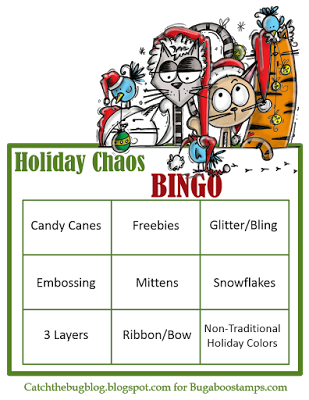 I used the middle row.. Freebie, Mittens, Ribbon/bow... I colored the cat in copics. I used a My Favorite Things circle die. The mittens are from Taylored Expressions.. it's from the kitchen set and I used the die from that set and instead of using the stamp to make it look like an oven mitt I just colored it with copic pen and used Nuvo dots to give a Christmas mitten look. I added bakers twine. I needed something else on the background so grabbed my washi tape and then stamped Simon Says Ho! Ho! Ho! along the top. I think she is giving a sarcastic Ho! Ho! Ho!.. 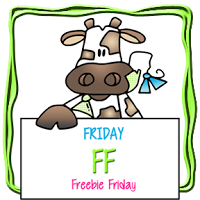 Grab the Free Friday image and chose your BINGO row and make that fun card and post to Catch The Bug.. It's the last day of our Christmas Chaos.. Hope you had a blast. Welcome to our Holiday Chaos at Catch the bug with images from Bugaboo. 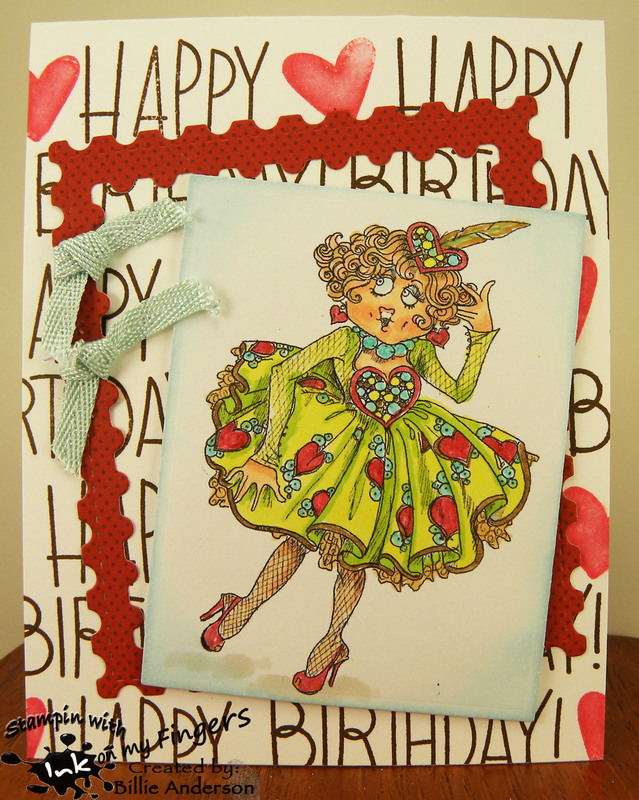 USE AN OLD IMAGE AND OLD PAPER FROM YOUR STASH..
Cards und more #173 - Oooh sooo cold!! This is the image I chose to use called Are we ready my friend? 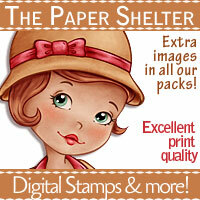 I had to use this image because it's so cute and I had this cute sentiment that went perfect for my Dear hubby.. I stamped it in red and then versa mark stamped it over the rest of the background. I added XO along the bottom for extra love for my hubby.. The sentiment looked a little plain so added the holly by the sentiment. I colored the darling image in copics and added glitter to the whites of his fir and the deer bell. I hope you find time to play along. 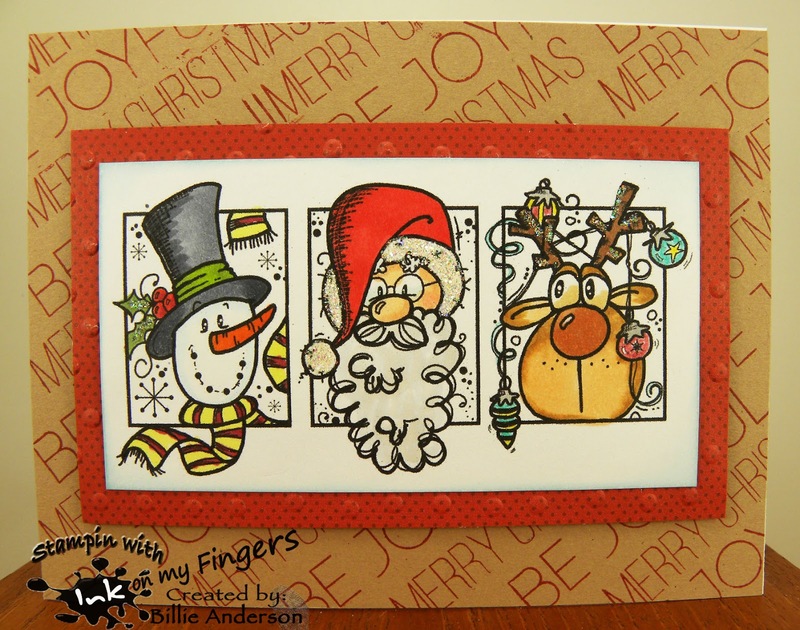 Make your Christmas card for your love and add a sentiment.. 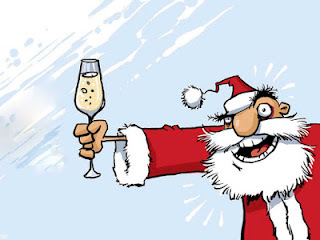 This is my card using the image called Santa with presents Boy it's hard to come up with a funny Christmas sentiment.. so I went to my standby sarcastic sentiments from Dylusion.. and chose one of the less sarcastic ones.. Thou shalt not whine.. and then Tech. Tuesday sentiment That Christmas feeling.. 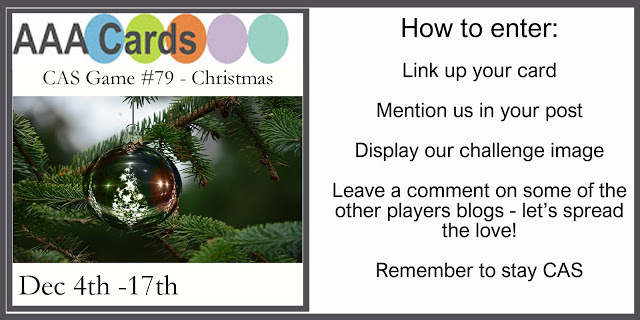 I know we have all had kids or know of kids and some adults that whine about Christmas.. and that Christmas feeling.. so thought this one worked to make it funny.. I cant wait to see what y'all come up with.. I will be taking notes for next year if there is a need for a funny sentiment so get your funny card over to Catch the bug..